What follows are some suggestions that we hope can assist Christians in the experience of observing the Week of Prayer for Christian Unity and celebrating the 2014 theme of "Has Christ Been Divided?" (cf. 1 Corinthians 1:13). This is by no means a comprehensive listing. We hope that as you create your own opportunities of prayer for Christian unity you will share those with others. Each new experience of prayer and gathering provides the Christian faith community with opportunities to grow in our understanding of one another as we celebrate our unity and common mission. Schedule at least one major Ecumenical Celebration of the Word of God during the Week of Prayer. The celebration can fall on any day of the week. Ecumenical Sunday, that is the Sunday falling within the Week of Prayer (January 19 in 2014), or the first day of the Week (January 18), or the last (January 25), often works well. These services of prayer tend to be easier to schedule as evening prayer services. In some communities Christians come together to pray for unity at another time of the year. The materials provided may be used flexibly. Organize tours of area churches conducted by guides who can share each church's art, architecture, history, organization, liturgical traditions, membership profile, outreach programs, etc. Conclude with a time for refreshments and fellowship. Sponsor a contest—essay, prayer, art, poster—to involve young people in an effort to articulate and illustrate the quest for Christian unity or the 2014 Week of Prayer for Christian Unity theme. Offer prizes, display the entries and include the winners in a Week of Prayer for Christian Unity event. Organize joint meetings of similar congregational groups—catechists and Sunday school teachers, parish councils and vestries, finance committees, youth, seniors, men's, women's, interchurch families for prayer, socializing and informal sharing of experiences. 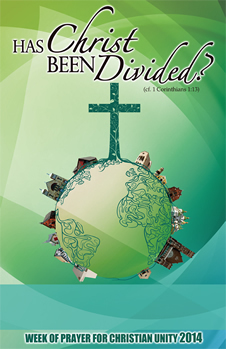 Schedule joint Bible study sessions around 1 Corinthians 1:1-31 and the scriptural theme of “Has Christ Been Divided?” as suggested for the 2014 Week of Prayer for Christian Unity. These could be hosted in homes or in parishes on a rotating basis. Ministers and teachers of various congregations could also take turns as worship leaders and study guides. The gathering should include informal prayer for the unity of the Church. Hopefully, the group might wish to extend such study and prayer throughout the year.